Just because most of us love pasta and we add veggies to it, it doesn’t mean that pasta is a healthy dish. My personal take is that it is okay to include it 1-2 times a month to satiate our taste buds. But if it becomes part of our daily dinner menu, then it is imperative that we understand the nutritive facts and make an informed decision. Let’s first talk about the pasta - the different types (penne, macaroni, spaghetti, fusillini etc). First, there are these fully processed, maida based ones from pasta brands like SunFeast, Maggi, Bambino or MTR. The farther we stay away from such pasta, the better it is for our health! Next, we have a range of imported pasta from brands like San Remo, Barilla, DiSano etc. 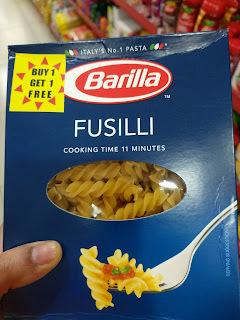 Most such brands offer pasta made with “durum wheat semolina”. Durum wheat is a kind of wheat that is specially used for making pasta. Grains that keep all three of parts of the original grain kernel -- germ, bran and endosperm -- in their original proportions after being milled into flour, are called whole grains, according to the Wheat Foods Council. In the case of durum wheat semolina, they are not made from whole kernel, unless the package explicitly states “100% whole grain durum”. The semolina is so refined and processed that there is very little fibre present in such pasta. 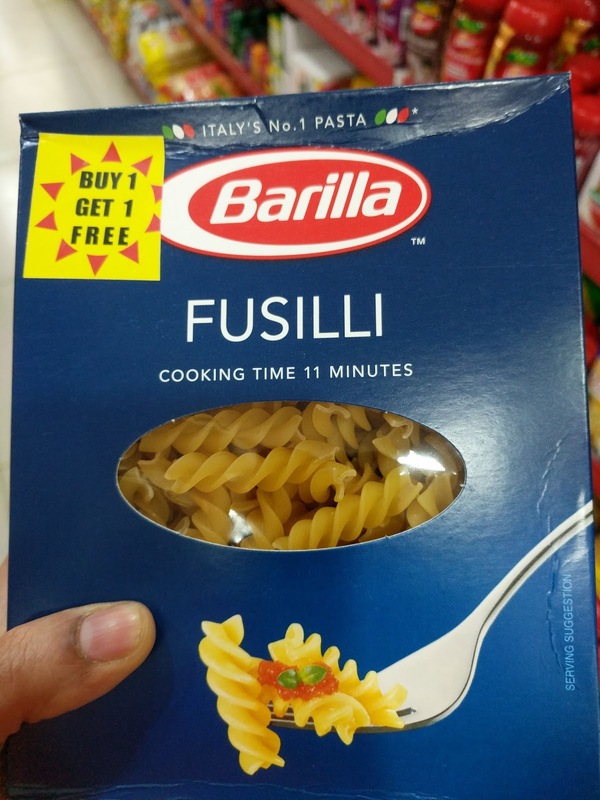 I looked through the pasta aisle in a supermarket in Bangalore and all I could find was just ONE pack of pasta that stated “100% whole grain”. Rest all were made with durum wheat semolina. To give you a comparison, 1 bowl of cooked white rice contains 44 gm of carbohydrates. So all those of you who believe that white rice is bad and have switched to pasta for dinner, please note this fact. Also note that if you like to have a garlic bread toast along with your pasta, then the carbohydrates will increase even further. 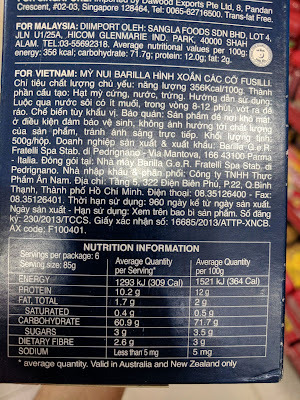 One might argue that we also need to consider the protein levels. Durum wheat semolina is higher in protein (10.6 gm per serving) as compared to rice (4 gm per bowl). But our Indian cuisine always combines rice with different varieties of lentils and pulses such that we get adequate levels of protein. Summary - pasta made with “durum wheat semolina” is high in carbohydrates and low in dietary fibre. It is definitely not a “healthy” choice. Let’s look at the second ingredient that goes behind making a delicious pasta - Pasta sauce. I used to buy the readymade pasta sauce many years ago but now I always make fresh pasta sauce at home - tomato based, white sauce or pesto. I never use any of the expensive pasta sauce brands available in the market these days. 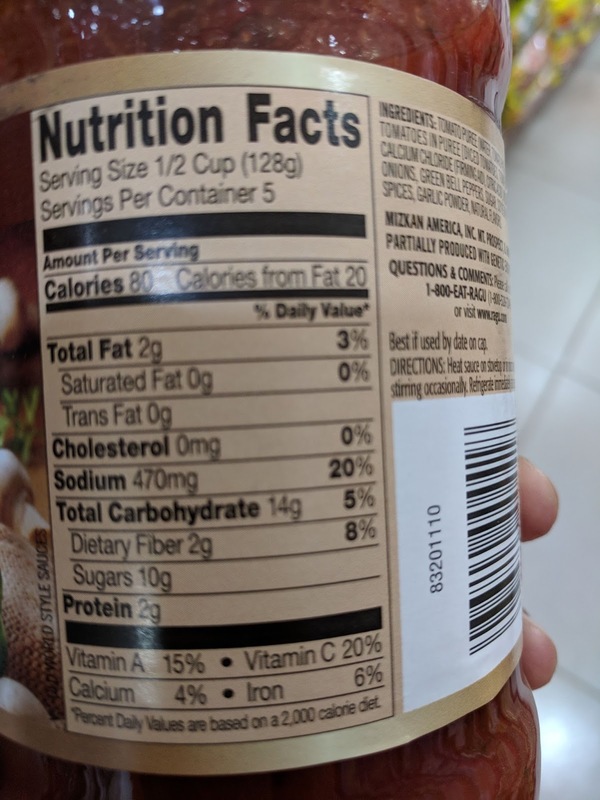 A single serving (128 gm) of the pasta sauce contains 470 mg of sodium. As I mentioned in my earlier posts, the adequate intake (AI) of sodium for kids in the age bracket of 4-8 years is 300 - 600 mg/day. If we take the average (450 mg/day), then 1 serving of pasta with pasta sauce will exceed their AI. And we usually add grated processed cheese that’s loaded with salt on top of the pasta. That’s exactly the reason why kids get addicted to pasta - TOO MUCH SALT in the readymade pasta sauce and processed cheese. Moreover, a single serving of this pasta sauce contains 10 gm of sugar (2.5 tsp of sugar). What is the need for so much sugar in a savoury sauce? The other brand that’s become quite popular with their packaged sauces and spreads is Dr.Oetker’s FunFoods. Their pasta & pizza sauce contains loads of preservatives, acidity regulators, stabilisers etc. 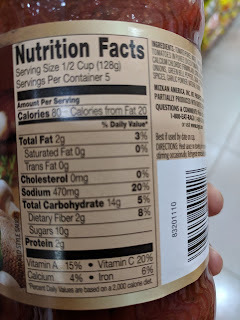 They haven’t mentioned “sodium” levels in their nutritional facts. 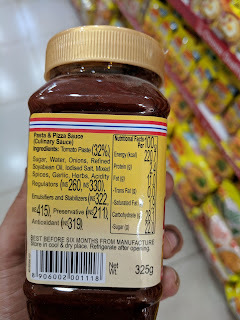 100 gm of this pasta sauce contains a whopping 22 gm of sugar (5.5 tsp of sugar). 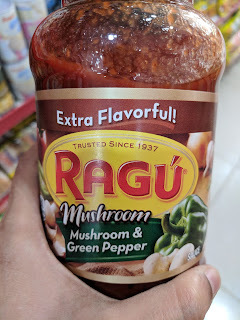 Summary - Avoid readymade pasta sauces at all costs. Make them fresh at home. It is extremely easy and quick to make. Here's my recipe for a homemade tomato-based pasta sauce. Pasta has become a regular dish in many Indian urban homes with high disposable incomes. If one is looking for weight loss, staying fit and healthy, managing lifestyle ailments like diabetes or high blood pressure, then pasta is definitely not a good choice to include on a regular basis. 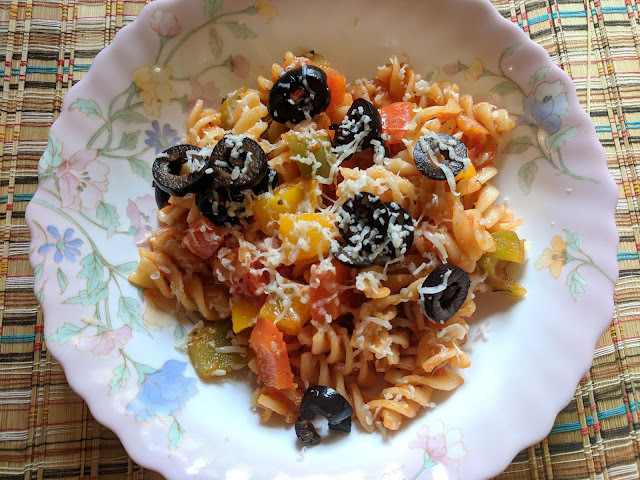 There is no harm in enjoying the dish 1-2 times a month, provided we make the pasta sauce fresh at home and add more vegetables. Why you should sit down to eat?